Since 1977, the Oregon Assembly for Black Affairs (OABA) has been committed to improving the status of blacks in Oregon. Through its activity and recognition programs, OABA supports the development of indigenous leadership that is being accountable, responsive, and productive. OABA places its emphasis on building a better Oregon for the black community. By doing this, it improves the lots of all Oregonians, says Aneesah Furqan, OABA secretary. In an interview with Colors of Influence, Furqan discusses the mission, vision and purpose of the OABA. 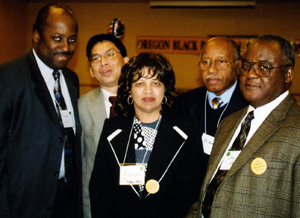 Aneesah Furqan, center, with OABA president Calvin Henry, far right, and other leaders at the Oregon Black Political Convention in 2006. What is the mission of the OABA? Our mission is to advocate and promote the involvement of Blacks in Oregon in the political process. We promote activities that govern housing, economic development, employment, media issues, safety and health. Blacks continue to deal with residuals of institutionalized racism and discrimination. While it is commonly quoted that since the Civil Rights Movement, we have made great progress and there are many people who have opportunities in the workforce. But there are still many others who are facing bias, and not receiving opportunities, when opportunities clearly exist. We feel that Blacks must be a changing force in Oregon politics, addressing the above concerns with State, local and community leaders. Blacks must understand, participate in, and affect the political processes at all levels. Political access to officials who affect these processes is essential to our community's development and growth. To that end, OABA hosts two major political events: OABA sponsors the Oregon Black Political Convention during general and state election year (even); OABA sponsors the Call-to Action Leadership Conference (odd year). How do you determine priority issues? Our priority is to bring issues of concern to the Black community to the attention of our State and local legislatures, employment entities, and civic leadership. OABA’s work and prioritization is accomplished via our standing committees in Economic and Community Development, Education, Employment, Finance, Housing, Political Action, Membership, and/or Media Communication. The issues we address don’t only apply to blacks. However, Blacks are at the lowest rung of the socioeconomic ladder: we are receiving the least amounts of benefits and services. We base our activities on the history and continuation of racial disparities for blacks in Oregon. We seek to address those issues that come forward from the community. The OABA slogan: An Organization for Change and Building a Better Oregon for the Black Community. What Benefits Black Oregonians Benefits All Oregonians. We don’t often see this in reverse. One of the things we’re educating our membership about is the “token” mentality – not accepting oneself as a Black person, as a person of value. It comes under this institutionalized behavior, most recently from affirmative action. Of course, we don’t want anyone hired just because. But I’ve also heard it said among Blacks that their supervisors and peers might think that they’re going to fill the place up with Black people. Here’s another example. We supported legislation issue help eliminate bias and fear from attorneys related to taking cases for black people. It’s hard for black people to find attorneys whether they can pay, or not. If they are appointed attorneys, those attorneys don’t represent them zealously. We attempted to correct the difficulties that black Oregonians have in obtaining effective legal representation in Oregon, regardless of their ability to pay or their status in society. How is OABA widening its advocacy reach? OABA is a statewide organization with members from various educational, economic, and professional backgrounds, and racial and ethnic groups. OABA Board of Directors meets monthly, and the meeting is open to all members. These meetings are held the first Saturday of each month and are conducted in Salem. We also hold general membership meetings once a quarter; and in various locations in the state. Location of the quarterly meetings include: March – Eugene; June – Corvallis; September – Portland; and in December – Salem. Membership recruitment is always a part of our quarterly meetings. OABA also sponsors an Internet list-service to further communicate and share information, ideas, and activities the promote individual/collective participation in the political process in order to enhance community life and value. To further our mission, OABA members partner with different organizations. For example, I represent the OABA in the Salem-Keizer chapter of the NAACP, as well as Oregon’s Department of Human Services Diversity Coordinating Council. We share issues and concerns, and put strategies in place to try to address those concerns. Some common employment issues include diversifying interview panels, giving feedback after interviews, providing input on developing questions for interviews. Recognizing that indigenous leadership is essential to the development and enhancement of the black community, OABA encourages black leadership to identify with the black community. We support leadership that is accountable, responsive, and productive. This indigenous leadership must be willing to communicate, cooperate, and coordinate with others in defining and presenting the needs and aspirations of the black community. Why is it important for blacks to be more involved in the political process? We believe all people should be involved in the political process. Statistically and traditionally, Blacks have been well below other groups in the state of Oregon, in terms of education and economic achievements. We have higher dropout rates and overrepresentation in the criminal justice system. We find that Blacks and other people of color don’t stand up in the political process due to a level of fear. Members of our organization seek to give a person a sense of security and to let them know that they are not by themselves – that they do have an advocacy organization behind them. How do you educate the youth in the political process? Every odd year, we sponsor the OABA “Call-to-Action Leadership Conference.” Every even year, OABA sponsors the Oregon Black Political Convention. We host interns from Oregon high schools and colleges, and universities who gain valuable exposure to the political process. At about age 16, I was introduced to the Nation of Islam, and later accepted the Muslim faith when I was 21. I grew up with the Nation of Islam. I believe in building bridges between the Christian and Muslim communities, especially among Blacks. Here in Salem, we don’t have a masjid or mosque, however, I occasionally go the mosque in Portland or Corvallis. I’ll also go to Christian churches for fellowship. We talk about sharing Islam and so forth. What do you like most about the work that you do for OABA? I like the fact that I’m able to communicate with citizens of Oregon, to encourage them to work with us to achieve common goals for the betterment of Oregonians. Members of the OABA are key resource people within the communities they work. I’ve been in political arena all my life, and joined OABA in 1993. Coming from California, I found Oregon to be a small, pioneering state that is moving in the direction of change. We have to be agents for that change. "We support leadership that is accountable, responsive, and productive." Economic And Community Development Committee Supports and promotes the development of competitive, quality black businesses. Education Committee Works for equal education opportunities for blacks at all levels, and to eliminate all unequal education opportunities and inferior educational programs; promotes and encourages multicultural education programs; studies statewide educational conditions affecting blacks; and keeps informed of school conditions and strive to correct abuses where found. Housing Committee Researches the availability and financing of housing for blacks; works with other organizations concerning housing issues; and investigate shousing complaints brought to the committee. Media Communication Committee Monitors local media to ascertain whether positive activities and events in the black community are given coverage and ensure FCC compliance; encourages broadcasting and advertising industries to upgrade and improve the quality of children's television, particularly as it relates to the diffusion of racial tension and isolation; works for employment opportunities for blacks in television, radio, cable television, and other media communication industries; and encourages blacks to become owners of media franchises. Political Action Committee Encourages blacks to understand, participate in, and affect the political process at all levels of government; develops a plan of action designed to create a political awareness within the black community aimed at alleviating the existing apolitical condition; implements programs to educate the black community about the most fundamental aspects of local, state, and federal government; and mobilizes black participation in the political process, by a statewide voter education program and follow through with a vigorous statewide voter registration drive; worsk for the enactment of municipal, state, and federal legislation designed to improve the political, educational, social, legal, and economic status of blacks in Oregon; recommends the endorsement of candidates for public office who are supportive of affairs of the Black Community; establishes a political relationship on a statewide basis with all minority groups to form a viable coalition of mutual concerns.